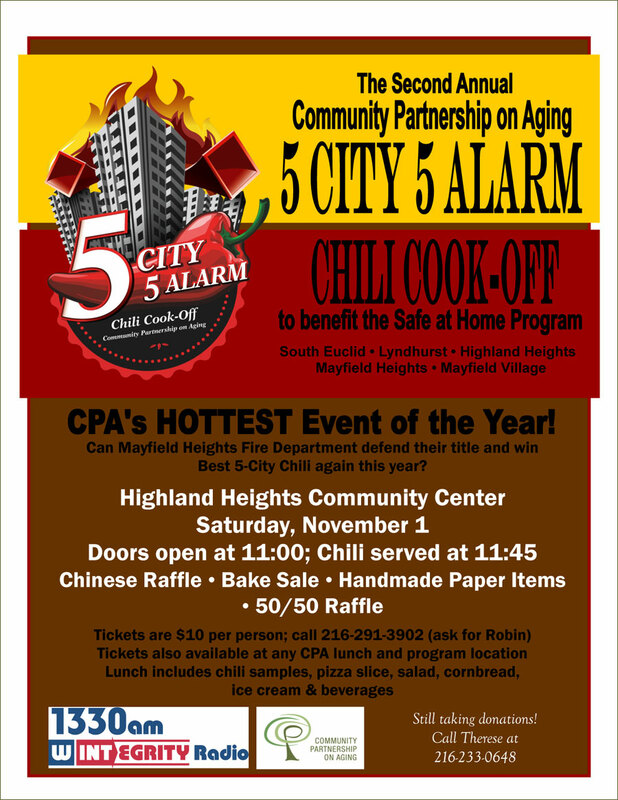 The heat is on for the Second Annual 5 City 5 Alarm Chili Cook-Off, which will take place on Saturday, November 1 (doors open at 11:00AM) at Highland Heights Community Center! Fire department staff from South Euclid, Lyndhurst, Highland Heights and Mayfield Village are busy making plans to attempt to steal the Best 5-City Chili trophy from 2013 winner Mayfield Heights Fire Department! This year’s event will also include a Chinese Raffle of donation baskets, 50/50 raffles, a bake sale and more, all to benefit the CPA Safe at Home Program. The $10 event ticket includes chili samples, pizza slice, salad, cornbread, ice cream and beverages and they are going as quick as a hot flash! To get your tickets, call 216-291-3902 (ask for Robin). This year’s Chili Cook-Off is sponsored by 1330AM WINT radio; Gold Sponsors Ohio Savings Bank Mayfield Heights and The Cleveland Women’s Journal, along with Table Sponsors Aberdeen Crossings, Gates Mills Club, Grande Pointe Healthcare, Hillcrest Hospital, Kemper House, Romeo’s Pizza, Sun Plum Market, University Suburban Health Center and Zounds Hearing!